You *MUST* have read of my most fabulous weekend in Quadra Island last year when I participated in the fantastic Tastes of April Point 2011. Tastes of April Point is a fantastic weekend of food, wine, and relaxation. If you have never stayed at April Point Resort, you are definitely missing out. I can tell you this because I have, in fact, enjoyed Tastes of April Point before (and will again this year!). This fall, from September 14 to 16, 2012 Tastes of April Point will be showcasing some biodynamic wines paired with amazing food. Wines from the Rodney Strong Portfolio will include: Charlotte’s Home Sauvignon Blanc, Chalk Hill Chardonnay, Russian River Pinot Noir, Knotty Vines Zinfandel & Alexander Valley Sauvignon. Guests will be able to walk around the property exploring all the weekend’s events, including a selection of local cheeses, an exploration of Mediterranean flavours through the olive, a wine crushing and oyster tasting event, a presentation on bean-to-bar chocolates with perfect pairings and an exotic tea session. The weekend is topped off with a luxurious Sunday brunch. You can book online or calling April Point Resort at 1-800-663-7090. And I have a fantastic giveaway for a lucky reader of mine: Weekend for two at Tastes, including flights on Pacific Coastal from Vancouver to Campbell River, and all transfers to the resort.. An amazing prize, as you can tell. April Point Resort & Spa is a west coast oasis tucked into a protected cove on Quadra Island. The resort’s rooms and cabins are nestled in the trees and each have beautiful ocean views. Guests spend time in the Aveda Spa, explore Quadra Island on interpretive tours or get to know the area’s spectacular residents on wildlife tours. Or, they simply sit back and let the stresses of the world slip away. From Vancouver take the ferry to Nanaimo and take the Island Highway to Campbell River. (We recommend taking the Old Island Highway which hugs the scenic coast and takes you through the island’s charming villages.) From Campbell River either take the free 10 minute water shuttle from Painter’s Lodge or BC Ferries’ 10 minute ferry to Quadra Island. 1) Comment on my blog entry telling me which one of the Oak Bay Marine Group resorts you would want to visit and why. I do have a soft spot for April Point Resort on Quadra Island, where Tastes of April Point takes place, but do definitely want to check out their other resorts. 2) Comment on my pin of this post on Pinterest, also telling me which OBMG resort you’d like to visit and why. 3) Repin my pin of this post on Pinterest. Total value of this contest is in the range of $1,500 (prize pack, times two plus airfares and transportation). It does not include tips nor gratuities, nor additional beverages other than those included with each Tastes of April Point activity. As with any of my contests that involve wine, you MUST be of legal drinking age to participate in this contest. Flights to Campbell River will depart Vancouver, and therefore transportation to and from the city of Vancouver for out-of-the-city and out-of-province winners will be their own responsibility. I will have this contest active for 2 weeks, and will draw winners on August 21st, 2012 at 2pm. Any entries AFTER the deadline will be voided. Good luck everyone! And if you don’t win, you totally should still check out Tastes of April Point, it’s an amazing event with great value. You can read my full coverage of last year’s event here. I’d like to visit Canadian Princess Resort. My friends tell me that the area is a lot of fun but the hotel rooms are usually quite expensive. I’d love to visit April Point Resort & Spa as never been to Quadra Island. The April Point Resort sounds absolutely AMAZING! I had no idea that Quadra island was home to such a thoughtful and decadent experience. Of course I would LOVE to visit and indulge my foodie/libation senses for a romantic get-away with hubby! Its not often you come across such unique places. I’ve always wanted to visit the Queen Charlotte Islands, so I would say the MV Charlotte Princess would be my fave spot. However, this trip to April Point Resort & Spa sounds incredible! Painter’s Lodge looks nice, but I think I have to agree with you Raul, that April Point Resort is where I’d like to be. I want to improve my Gulf Island knowledge, and would happily start with April Point Resort on Quadra Island! I would love to visit the Candian Princess Resort because I love beaches and it’s along Uclelet-Long Beach. I’d love to stay at the Cape Santa Maria Beach Resort! Cape Santa Maria Beach Resort in the South Bahamas is my favourite! Hello tropical watera and pristine beaches! I’m with Brenda — I’d love to stay at the Cape Santa Maria Beach Resort too! Oh the Cape Santa Maria Beach Resort would be my pick as well – its beautiful and warm and a long way from Vancouver busy-ness! without a doubt the Cape Santa Maria Beach Resort – four miles of pristine beach in the South Bahamas?! The resorts all look fantastic – but the sun, the sea and time at Cape Santa Maria Beach Resort … now there’s an anniversary! I’d love to visit the Canadian Princess Resort because I’m passionate about fishing. Being on a boat makes me feel relaxed. Thanks for the givewaway. Having never been to Quadra Island, I would love to visit April Point Resort & Spa. Thanks for the opportunity to win! My husband and I have never been to any of these coast islands, but have wanted to for quite some time. All of the resorts look beautiful, especially the King Salmon Resort which is my husband’s dream come true – salmon fishing on the coast! I’ve never been to Quadra Island, this giveaway sounds awesome. I’ll try to visit Painter’s Lodge in Campbell River sometime soon, having a trip and some time to learn new stuff sounds like a great trip. I haven’t yet visited Quadra Island, and would LOVE the opportunity to check it out! Especially during the ‘Tastes’ event, as I’m a wine and food lover. I also hear good things about Painters Lodge, and would like to visit there, as well. April Point Resort & Spa sounds fabulous! We have never been and would love the chance to experience the weekend package full of divine dining and delightful scenic views. April Point Lodge on Quadra Island is my fave! 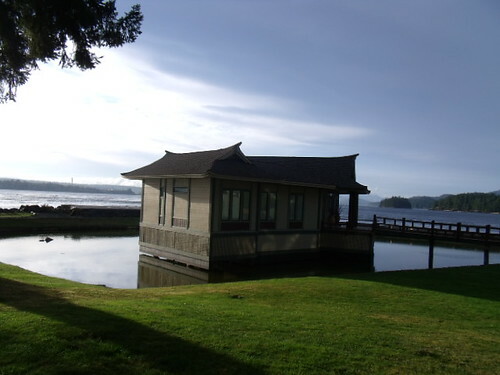 Apri Point Lodge on Quadra Island – because your blog post makes it sound fantastic. I’d also like to visit Canadian Princess Resort on Ucluelet-Long Beach to try fishing and watch for marine wildlife. April Point Lodge would be a great getaway! The april point resort sounds marvelous. Also wouldn’t mind a visit to the Charlotte Princess fishing and resort sounds amazing. I lived in Campbell River for a year and a half. I was so busy surviving that I never got a chance to get over to Quadra Island and visit April Point. I did love Painter’s Lodge although I never got to stay there. I’d like a chance to go back and do it right and stay at April Point. I’ve never been to any of the Oak Bay Marine Group Resorts. I do love the Gulf Islands as does my partner but we usually camp. After reading about your experience last year, I would love to be able to whisk her away for a weekend at the Tastes of April Point, food and wine are definitely two of our passions! The only time I’ve been to April Point was with my daughter when my husband was fighting pirates with the Canadian Navy. It was so beautiful & so peaceful there. That was a really long deployment and it was awesome to have some relaxation time to recharge. I would love to bring my husband there for our anniversary but ours is in October and April Point isn’t open then. He’s usually away every summer for work so the Tastes of April Point in September would be perfect!! 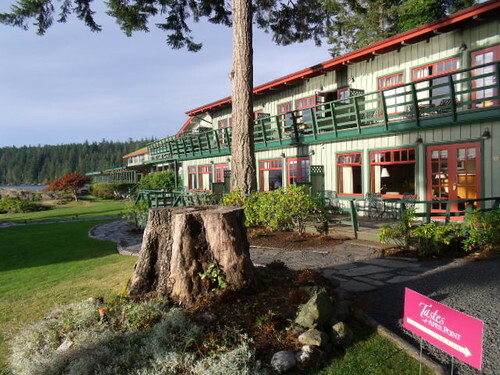 I’ve never been to Quadra and would love to check out the April Point Resort! It looks and sounds amazing! I would love to visit Painters Lodge! When my family first moved to the west coast 20 years ago this is where we landed and i havent been back since. This beautiful resort holds some of my happiest memories fishing, laughing, swimming an watching wildlife. Cape Santa Maria Beach Resort – beach & ocean…just look at the colour of the blue water! Painter’s Lodge because I love fishing for salmon!!!! I would love to visit April Point Resort & Spa and paticipate in the taste of April Point. By reading Oak Bay Marine Group’s website April Point is described as both adventurous and relaxing like me. Also, it would be a wonderful getaway from the crowd and a great place to just simply relax and watch the world go by with loved ones. In addition, it is in close approximity within Painter’s Lodge. I’d love to visit the April Point Resort because I’ve never been to Quadra Island and I trust your recommendations. I have never been to Quadra Island and this April Points Resort sounds amazing! Fishing at the King Salmon Resort looks amazing! April Point Resort sounds lovely via reading your post last year and visiting their website. Driven to most parts of Vancouver Island, but never visited the surrounding islands. Taste of April Point is also an added bonus with great food and wine filled with happiness. I have heard of Painters Lodge many times but have never visited. If I had to pick one, it would probably be the Bahamas resort though! Hot sun, sand, and rum! What could go wrong? I would like to visit April Point Resort, as I have never been to Quadra Island but would dearly love to take my partner to such a beautiful place, and let her enjoy a quiet paradise away from the city. April Point resort is where I would like to go. I’d love to check out April Point Resort on Quadra Island, i’ve never been! I’d love to see the Canadian Princess Resort, sounds amazing! I’d like to visit Quadra Island. Katherine was telling me about it, and I think a chance to get away and eat cheese, olives, and chocolate and drink wine and tea sounds perfect! April Point Resort sounds like the perfect place to take a breather and unwind a bit from the stresses of academia. Painters lodge for the whale watching and fishing!